We are leading trader of AC Motor Drives. Simple wood cutting, conveyer belt, wire drawing machine, etc. 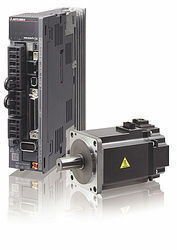 Sensorless Vector Micro AC Drive, the compact design is ideal for small and medium horsepower applications. The M drive is designed to provide an ultra-low-noise operation, and includes several innovative technologies that reduce interference. These drives are checked on the basis of defined industrial standards that serve the requirement of our valued clients in an effective manner. 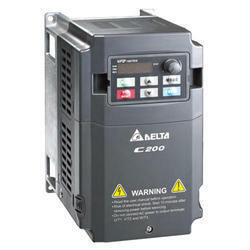 We are trader and suppliers for a wide range of Mitsubishi AC Drives. 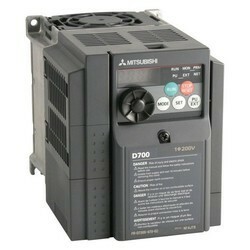 We have in store for our customers an extensive range of Mitsubishi AC Drives. These are in compliance with the high quality standards and well known for trouble-free operation, sinusoidal output and high resolution & precision. New functions like the advanced vibration suppression system and the further improved real-time auto tuning ensure maximum precision, very short positioning times and simple installation. ¿¿¿ The FR-A800 series has a two channel emergency stop for safe shutdown. This ensures safe operation in compliance with the European Machinery Directive without installation of another contactor. The FR-A800 thus conforms to the EN ISO13849-1/PLd. 3, EN 61508 and EN 61800-5-2 SIL2 standards. ¿¿¿ The operation panel with the one touch Digital Dial allows direct access to all important parameters. The FR-A800 series also allows the connection of a Mitsubishi Electric graphical operation terminal (GOT). Communication parameters for the HMI connection are automatically set as a batch. The drive can be controlled and monitored by a controller via network. For the major network protocols such as CC-Link IE Field, CC-Link, Profibus DP/DPV1, Profinet/Ether- Net IP/Ether Cate (to be released soon) and SSCNETIII/H as well as DeviceNet™ and LON WORKS communication options are available. 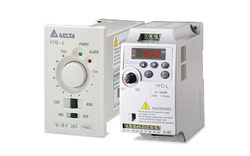 RS485 communication (Mitsubishi Electric drive protocol, Modbus-RTU protocol) is supported as standard. We are remarkable entity, engaged in offering superior quality Field Oriented Control AC Motor Drives. In accordance with predefined industry standards, these drives are precisely manufactured using supreme quality components and ultra-modern techniques by dexterous technocrats at vendors’ end. Owing to their perfect functioning, the provided drives are widely acknowledged by our patrons. We offer these drives at market leading prices. Price Range:- Rs 5000 - Rs 18,00,000/Piece. 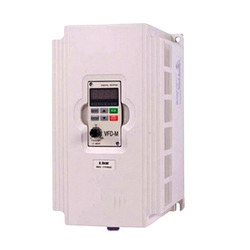 We are trader and suppliers for a wide range of Mitsubishi AC Motor Drives. We have in store for our customers an extensive range of Mitsubishi Motor Drives. These are in compliance with the high quality standards and well known for trouble-free operation, sinusoidal output and high resolution & precision. New functions like the advanced vibration suppression system and the further improved real-time auto tuning ensure maximum precision, very short positioning times and simple installation.